This is register of all extant and otherwise documented musical prints issued in the Australian colonies by printers and publishers mostly active before the end of 1851. For extant items, titles are live linked to TROVE entries for catalogue records and digitised exemplars, or in a few cases to repositories whose holdings are not currently listed in TROVE. The page also serves as a register of prints otherwise documented but for which copies are not currently known to survive. A few words-only song prints published and sold separately are also listed here, but there appear to have been relatively few of these (compared, for instance, to the mass of song published in homeland Britain as broadsides); in the colonies most such local songs were instead published in newspapers, magazines, and occasionally books (local and UK), and these are not included here but may be found in the main checkists. British broadsides on Australian colonial subject matters (convicts, emigrants) are not included here in the absence of persuasive evidence that they actually circulated here at the time. In a small number of sheet music editions on this page, the music pages were originally drawn directly onto lithographic stones, or transferred to stones from handwritten exemplars. From the mid 1840s, Isaac Nathan's typeset music editions are the earliest Australian examples of that method. However, in common with most British sheet music in the first half of the 19th-century, the majority of Australian music pages were either printed directly from engraved plates, or page images from engraved plates (or from printed exemplars) were put onto stones by transfer lithography. Twyman (1996, 501 and following) warns of the considerable difficulties of identifying the method used from the printed results alone, and outlines some helpful procedures for doing so. It is even more difficult to do so reliably from digitised images, however useful they are in almost all other contexts. In the case of the fairly small number of Australian editions dating from before the 1850s that have illustrative covers, the cover was more likely to have been printed lithographically, entirely independent of the method used to print the music pages. 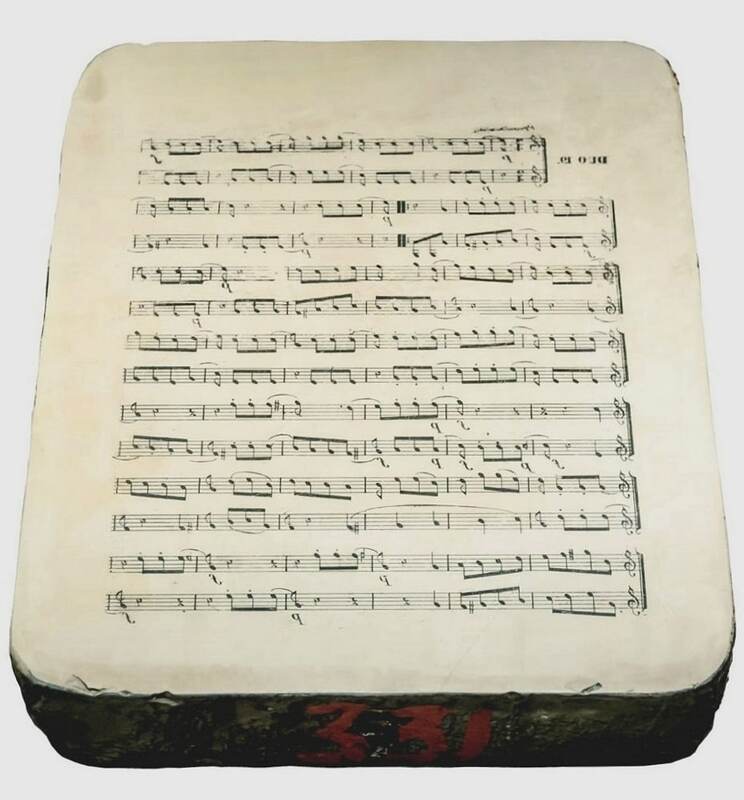 Where an engraver or lithographer's name appears in the cover design, it should not necessarily be assumed that the same artisan was involved in music engraving. In the case of reprintings in the 1850s, or reissues of the remains of extant print runs under different covers, the later covers are in some cases printed from moveable type. It does not always follow, therefore, that a printer whose name appears on the cover was necessarily responsible for printing the music pages. Where several print editions by the same or other publishers/printers used the same plates/stones, or by some means tranferred the original page images to new stones for printing later editions, this is noted (for simplicity in the listings below, the word "plates" is used, regardless of the method). In some cases the later editions are actual reprints; while, in other cases, the remains of an earlier print run were simply given a new titlepage and/or cover, and often also a new publisher identification (as, for example, where Francis Ellard's editions were reissued, successively, by Woolcott and Clarke, and J. R. Clarke). At least in some cases, early colonial publishers probably also imported cheap mass-produced printed editions from Britain, and merely reissued them locally under their new own titlepages (a method much more common toward the end of the 19th century). A supplementary page, covering publications of the 1850s (printers and publishers first active between 1852 and 1860) is planned for the future. A working list of those borderline printer/publishers, first active during 1850, but who will be included in the later page is given at the foot of the page. The entries are grouped together by printer or publisher's names, in chronological order of that person's first publication; links to further information also appear under the individual's heading. Editions are listed under separate headings, first dated or datable prints (in chronological order), followed by undated and so far undatable prints (in alphabetical order by title). In both cases above, no copies of the print has been identified, and the title is simply bolded. The bird waltz / Francis Panormo / Sydney: Published at F. Ellard's Music Saloon, George St.
Overture to The caliph of Bagdad / Adrien Boieldieu / Sydney: Published by F. Ellard, George Strt. The British staff quadrilles / W. H. Montgomery / Sydney: Published by F. Ellard, George St. 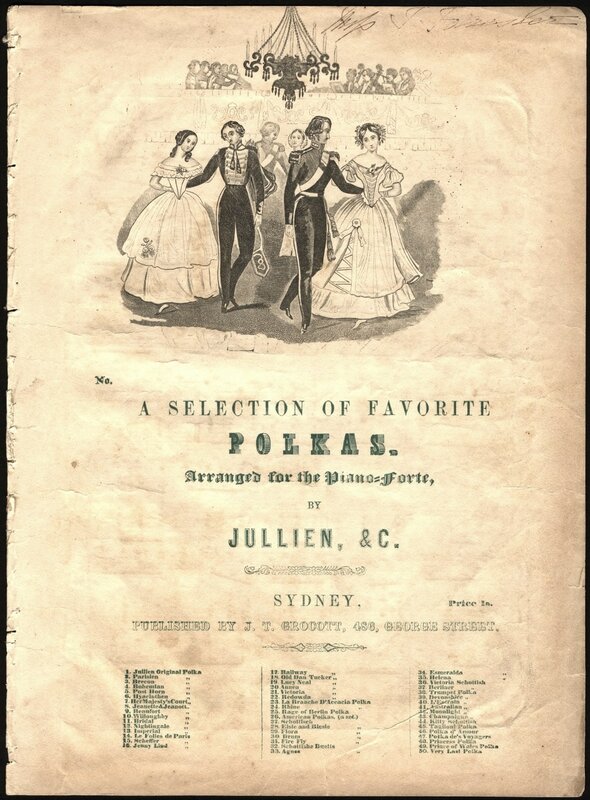 The daughter of Israel / Charles Sloman / Sydney: Published by F. Ellard, George St.
Les demoiselles (quadrilles, new series 1st set) / Duarte J. Dos Santos / Sydney: Published at F. Ellard's Music Saloon, George St. The fairy boy / Samuel Lover / Sydney: Published by F. Ellard, George St. The gems or Les favorites (a set of quadrilles) / Henri Herz / Sydney: Published by F. Ellard, George Street / "Fourth edition"
Home! sweet home! / Henry R. Bishop / Sydney: Published by F. Ellard, Music Seller, George Street / "Thirteenth edition"
Mozart's three favorite waltzes / Sydney: Published by F. Ellard, George St.
Oh give me but my Arab steed! / George Alexander Hodson / Sydney: Published by F. Ellard, George Street / "Fifteenth edition"
The Royal Irish quadrilles (piano duet) / arr. Ernest Kollman / Sydney: Published by F. Ellard, Music Seller, George St.
Wilt thou meet me there, love? / B. Hime / Sydney: Published by F. Ellard, George Street / "Third edition"
I met her in the crystal halls / Stephen Glover / Sydney: Woolcott and Clarke / [October 1852] / "Engraved by F. Ellard, Sydney." The Great Britain polka / Frederick Ellard / Sydney: Woolcott and Clarke / [November/December 1852] / "Engraved by F. Ellard, Sydney"
The New Year's gift schottische / Sydney: Woolcott and Clarke / [December 1852] / "Engraved by F. Ellard Sydney"
A young lady's dream [The young lady's dream] / ? / Sydney: Woolcott and Clarke / [December 1852] / "Engraved by F. Ellard, Sydney"
Child of earth with the golden hair / Charles E. Horn / Sydney: Published by T. Rolfe, Hunter St. Note also that the cover image for Ellard's edition of Savourneen deelish is signed "T. Bluet Print"
Les echos quadrilles / pub. no: "29"
Les folatres quadrilles / pub. nos: "17", "41"
Love not / John Blockley / 3rd edition / Sydney: G. Hudson & Co.
Trading as "publisher, stationer, printseller, picture frame maker, printer", at 476 George Street (until March 1847); there is no certain evidence that he published any music before taking over Ellard's busines and premises. Berliner schottisch / ? Marschan / Sydney: printed and published by J. T. Grocott, Music Saloon, 486, George Street / pub. number "725"
The duke of Reichstadt's waltz (to which is added Venetian barcarolle or Italian air) / [Strauss] arr. Henri Herz / Sydney: Published by Grocott, music seller, George St.
Scheffer polka / M. Lardelli / Sydney: Published at J. T. Grocott's Music Saloon and Stationery Warehouse George St. The printer Thomas Trood died in January 1850, and his wife Anne (d. 1871) carried on trading at Trood's Albion Printing Office until she sold the stock and trade early in 1851. For other comparable images of lithographic stones, see Twyman 1996, 65 (plate 40), 67 (plate 41); and for a relief-etched stone, 63 (plate 39).